Cake & Heels: ...aand I'm back. With a homemade dinner from my boyfriend! ...aand I'm back. With a homemade dinner from my boyfriend! I don't have the energy to explain the whole Berlin situation quite yet. But let's just say it was incredible, once in a lifetime, blah blah etc. I'll get to those posts soon enough. I'm still trying to mentally wrap my mind around the experience. Plus, I need to taste test all the chocolate I brought back so I can write about it intelligently. You know how it is. 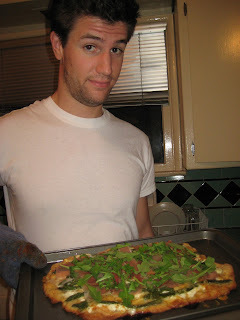 What I do want to talk about is the delicious pizza my boyfriend made to celebrate me making it back safely with both my kidneys intact, and not being sold into a prostitution ring. Granted it came out more like a flat bread for lack of an ability to turn it into a circle form. Once important lesson for next time... an important factor in dealing with Pizza Dough is to let it rest for a few hours before trying to stretch it out. Yep. That would have been handy to know. 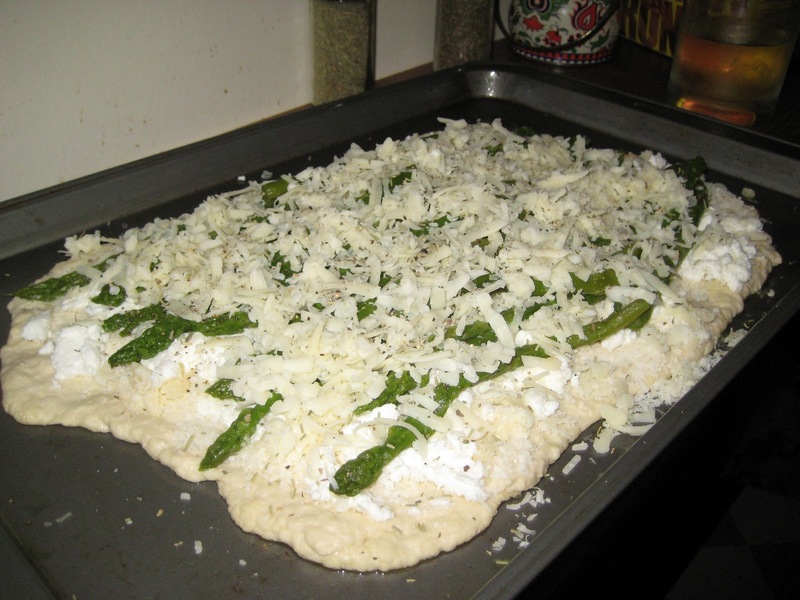 But otherwise, basically stretch out the pizza dough onto an oiled surface or wooden plate, top with ricotta first, sprinkle on the Parmesan, add on the Asparagus & top with the Mozzarella. We added a few sprinkles of Salt & Pepper, Italian seasoning & rosemary. Bake in a 375 degree oven for about 15 minutes or until the crust is golden brown. 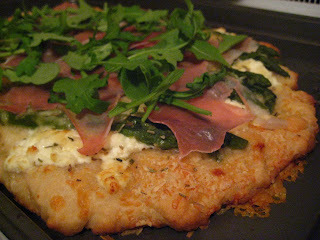 Take it out of the oven and top with the Prosciutto & fresh Arugula. Serve warm. Preferably with a nice glass of Gewürztraminer! I think perhaps (and this could have been a side effect from the poorly prepped dough) it was a little on the heavy side, so a light salad of sorts might work well to compliment the dish. Perhaps a grilled melon & toasted pine nut side? Mmm... that sounds good! Thanks Smush for a lovely dinner :-).